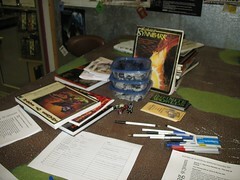 Thanks to everyone who attended, to our volunteer GMs, and to everyone who donated prizes. We had a LOT of stuff to give away. Much props to our venue of choice, Games Plus, too.